Why Is It So Damn Hard to Resist Product Building Before Testing An Idea? The other day I worked on an idea I wanted to test. I got so excited because I saw how finally all the puzzles of my hard work of the last years would fit into each other. I quickly came up with a few ideas how to TEST my idea. BUT instead of testing the idea, I already started ‘building’ the product and got confused. I confused the necessary pieces I needed to test the product with the final product itself. I want to test my idea with a paid webinar. I want to target small business owners that haven’t reached the digital age — yet and help them run their business more effectively and efficiently. I want to target them through Facebook and LinkedIn ads. The idea is about a “digital organization and productivity system” to run your business. I have been using the system now for years. It was born during my days at my first startups and got refined during my coaching of startup founders and their teams over the last two years in accelerator programs in Berlin and San Francisco. Basically, it’s a compilation of different principles, and best practices of books I read and experts I followed — put together into one system. It’s proven because I tried every tool out there, applied different methods and gained experiences — both on a personal and team level, both within a startup, as solo-founder and as a freelancer managing $0.5M project for 12 months with 10 people. Over the years, I compiled many notes and thoughts in Evernote. I never made a real effort to bring it all together. Even though I gave workshops or speeches where I created slides, I never put my system into a workbook or anything. That’s when I thought I want to test this idea. That’s when I confused testing the idea and building the actual product. 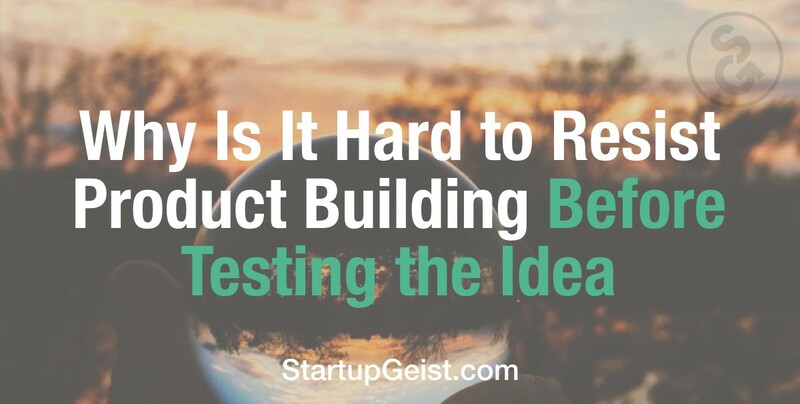 It’s so easy to jump into product building mode and jump over the actual testing of your idea. Then I wondered why this is. It doesn’t only happen to me but nearly all every startup founders and entrepreneurs I met. What do you think is the reason for building before testing your idea? I find it easy to analyze stuff, to find reasons why stuff doesn’t work, and other stuff works. I deconstruct the world around me, sometimes (or admittedly too often) over-simplifying to find QUICK answer. But quick answers aren’t the solution most often. They might calm my mind and let me move on but I’d like to see a fuller picture. A picture I can’t see for myself. That’s why I choose not to find a quick reason right now and like to ask YOU to share your reason(s). In your experience, why do we build a product before testing it? I think there are many reasons why this is happening. I am extremely curious to read about your #mindfucks — when it comes to product building and jumping over idea testing … please share yours. Share your ❤ below — and respond with your thoughts. About Danny: Hi, I bring ‘BE YOURSELF’ to my next level by sharing unfiltered, no BS thoughts here. I started StartupGeist to help students and recent graduates build a business — and have a good life. Originally published at dannyholtschke.com on April 6, 2016. Open Reflections on Being Authentic and True to Yourself.